Well, more like I love anything that is smoked. Give me some smoked pork ribs or some of that Italian smoked prosciutto called “speck”, and I’m one happy camper. But my heart lies with smoked cheese. Smoked cheddar, smoked gouda or queso idiazabal get my motor running. In fact, I seldom buy them because they are just too tempting. Once I start, I can't stop eating them. When I was a kid, my sis had to wrestle the knife out of my hand or I’d happily eat the whole slab of smoked cheddar, piece by piece. Sometimes I would even hide the piece of cheese in the refrigerator - under a head of lettuce or something - and deny any knowledge of how it got there - if my mum would later discover it. Here’s the thing about smoked cheese, it tastes like meat. Seriously. Once I made (GF) Mac & Cheese using smoked gouda, and I swear my friends asked me if I had put bacon it. Something to keep in mind for those vegetarians that may miss the flavor of bacon. Throw some smoked cheese in and you’re halfway there to the real thing. Do you know that you can actually smoke cheese on your BBQ? For real. All you need is a soldering iron, a tin can and hardwood chips. I would love to try it as well - even if that sounds a bit too MacGyverish to me - but something tells me not to. You know, I might burn down the house or something like that — talking about smoking everything. Better to walk a couple of blocks to Murray’s to get me some of their amazing maple leaf smoked Gouda. This is like the perfect dish to whip up during the summer when your garden’s too prolific or when you buy too much summer produce at the farmers’ market (e.g., zucchini and tomatoes). 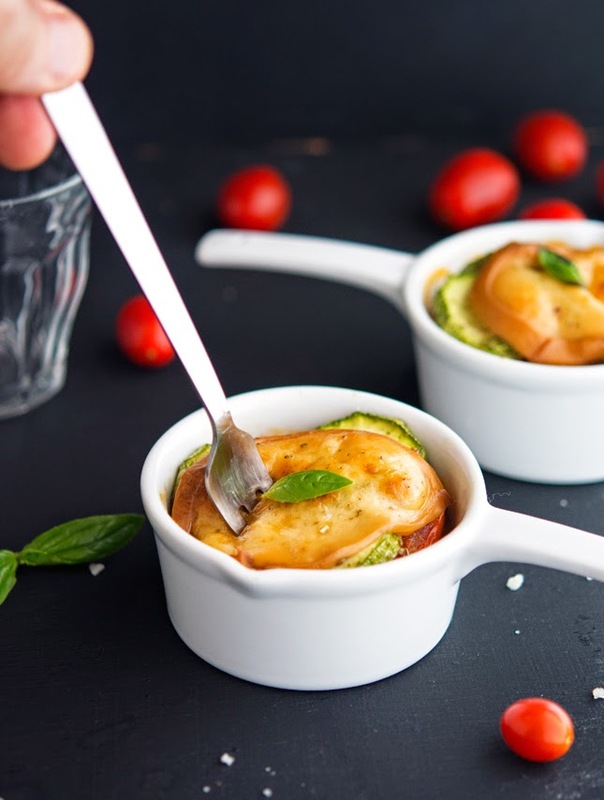 Roasted zucchini are layered with caramelized tomatoes and smoked cheese. This irresistible casserole is a nice vegetarian dish on its own or can be a great side to grilled fish or meat. Trust me, this recipe is always a hit. In fact, I usually have to double it all the time, and still there are no leftovers. Roasted Tomato, Zucchini and Smoked Cheese Casserole Print this recipe! Preheat oven to 400°F (200°C) and place a rack in the middle. Line two baking sheets with parchment paper and set aside. Wash the zucchini, cut the ends off and slice into ¼-inch thick rounds. Place zucchini rounds in a large bowl, sprinkle with thyme, ½ teaspoon salt, ground black pepper and drizzle with one tablespoon of olive oil. Toss until they’re evenly coated. Roast in the oven for about 10 minutes until they start to lightly brown. Remove and set aside. Wash tomatoes and slice into ½-inch thick slices and arrange them onto the remaining lined baking sheet. Sprinkle with oregano, garlic, remaining ½ teaspoon of salt, pepper and drizzle with remaining tablespoon of olive oil and balsamic vinegar. Roast in the oven for about 15 to 20 minutes, until the tomatoes are concentrated and beginning to caramelize. Remove and set aside. Lightly grease the bottom of 4 ramekins (or a 2-quart baking dish). 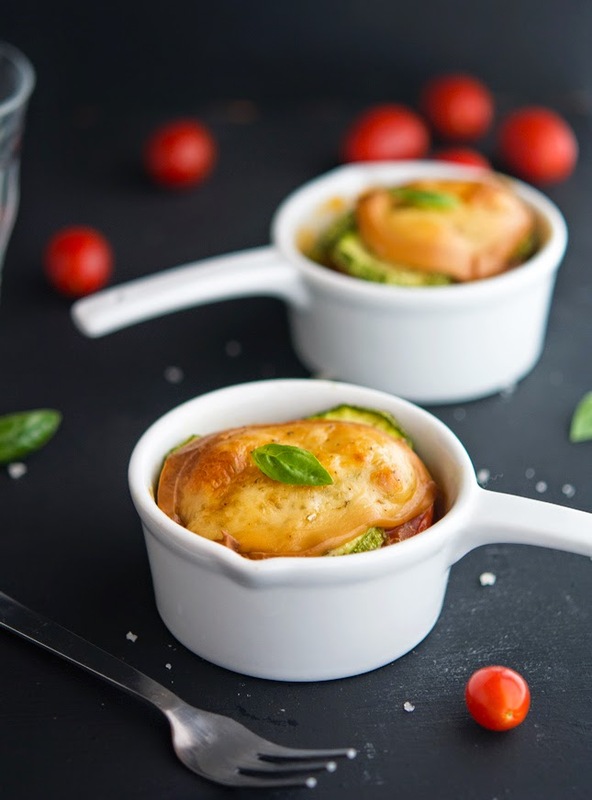 Cover the bottom of each ramekin with one tomato slice, then 4 zucchini rounds and top with one slice of cheese. Repeat to make 3 layers (or stop at 2 if they don’t fit into the ramekins) making sure to end with a slice of cheese. Bake in the oven for 8 to 10 minutes, until the cheese is bubbling. One serving yields 267 calories, 19 grams of fat, 9 grams of carbs and 15 grams of protein. 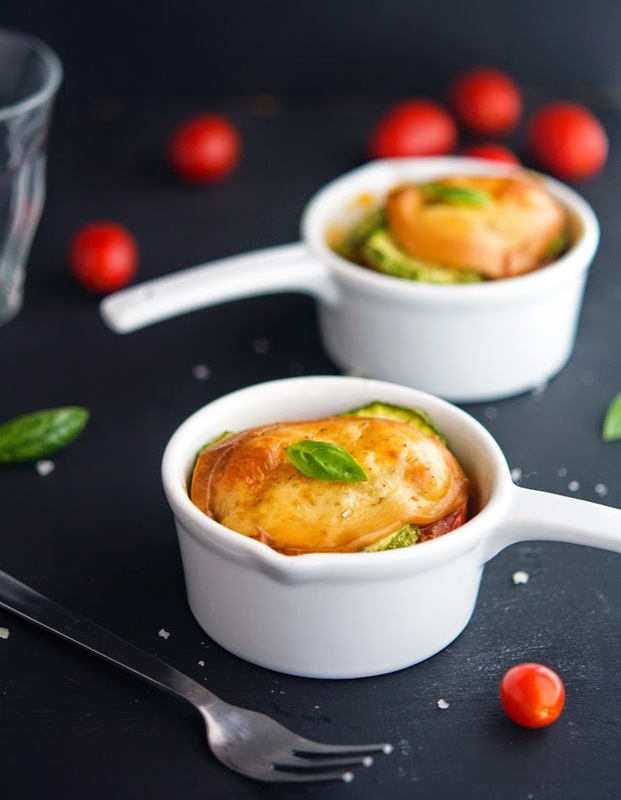 "Roasted zucchini are layered with caramelized tomatoes and smoked cheese. What’s there not to love?" My thoughts exactly! Yum. Makes me miss being able to eat tomatoes!! Oh no Lauren, I always forget that you can't eat tomatoes ...so sorry you can't try this recipe. 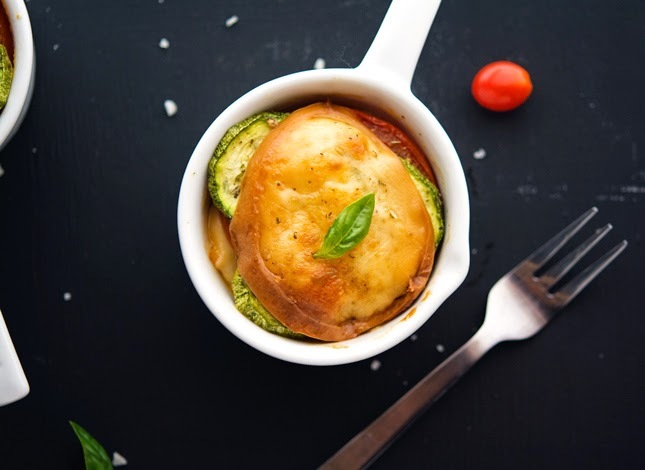 Your story of your sis and the cheddar block reminds me of my mom - she LOVES cheese so much so that she will buy only a small block after spending 45 minutes oogling all the cheese in the cheese case and she would be ALL over this smoked cheese topped roasted tomato and zucchini dish! And yay - it's vegetarian! Your mum and I have a lot of things in common! You hide food from your kids? Seriously? LOL Lauren that's so funny! Smoked anything wins my heart, but if I had to choose, I'd totally go for smoked cheese! Especially if it's paired with lots of caramelised zucchini and tomato ahhhh this sounds heavenly! My fave smoked cheese is queso idiazabal, unfortunately it's so expensive round here. I'm sure you can get some top quality idiazabal in Spain with at a decent price. I might to visit you soon! Aw man, someone give that cheese a nicotine patch!! Smoking is not healthy! lol! This looks crazy good!! I wish I could have it for lunch! You can totally have it for lunch, I have some leftovers in the fridge. If you're willing to get here, they're yours! This is a happy garden post, look at all these veggies! Totally loving this! Thanks Pam. I imagine you have tons of summer produce in your garden, must be amazing! Hi Mike, I have only had smoked cheese once or twice, will pick some up next time I go to the market and try this. Love the little white dishes! I have everything I need to make this, including the smoked cheddar! If you're a fan of all things smoked, try smoked salted almonds they're incredibly addictive! Smoked salted almonds are super duper awesome. Another item I seldom buy because I would just eat it all! OH my gosh!! Love love love smoked gouda cheese. This looks like the ultimate start to the day! Delish Mike, pinned! This looks amazing! Funny that you mention smoked cheese on the grill because I just made some of that a couple of weeks ago. It was so easy, and it tasted incredible! You should totally do it. But don't burn the house down...that would be sad. OK, now I have to make smoked cheese! Smoked cheese, huh? Well, I sampled it at a health food store for the first time the other day and even though it was clearly labeled using microbial rennet I spat it out - into a tissue and NOT in front of anybody - because I doubted it was vegetarian. Woah does it taste eerily like meat. I figure that's the point of it?! Still... I'll admit you made me curious again now, though, as this looks really good. Hahahahaha love the MacGyver reference!!! The theme song is literally playing in my head right now. Made this with smoked Gouda and it was truly awesome. Served it with a fruit salad and it was the perfect healthy meal. I have printed off a ton of your recipes and am working through them one at a time. Thanks so much for sharing.